We’ve got good news from our friends at FremantleMedia that they are still casting for upcoming game shows that will be taping soon! If you ever thought you’d like to be on a game show, here’s your chance. All you have to do is contact them! 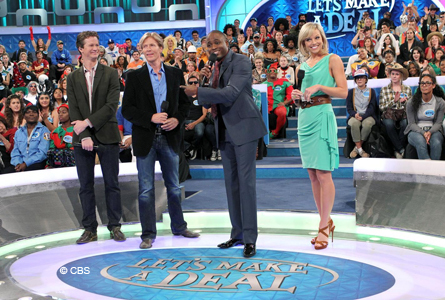 Be on “Let’s Make a Deal” like actor Jack Wagner (center). The producers of “American Idol” and “America’s Got Talent” are now searching for contestants and audience members for all of their current hit game shows that include: “Let’s Make a Deal”, “The Price is Right”, “Family Feud”, and “Total Black Out”. Syfy’s “Total Black Out” looking for contestants! 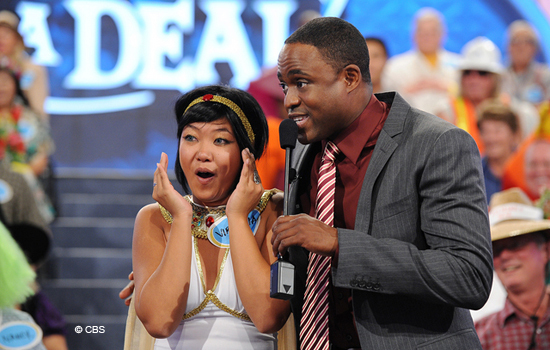 There is no guarantee that you will be selected to participate in a game show. And, you must be 18 years of age or older. hi my name is Erika! my brother and i love this show! we cant stop laughing from start to end! we talk about being so brave and how we would handle anything like a piece of cake! but . . . thats because we can see exactly whats going on. my brother ( Israel ) 21yrs and i 29yrs would love to audition and really go through the challenge of being able to go through anything and pass it in a jiffy!!! lol! Hi, me and my mom love total black out.we have fears out this world but would love to challenge our selves. My mom has always been my back none but in a situation.like the show I think I’ll be hers. Hi, me and my mom love total black out.we have fears out this world but would love to challenge our selves. My mom has always been my back bone but in a situation.like the show I think I’ll be hers.